Yesterday I gave you an introduction on how the banking system works. I hope you enjoyed yesterday’s post and you learned a lot. Today is a continuation of Part 1 where I will give you some caution on how to choose the bank you will park your money at as well as how you can safeguard your money in the bank better. I know that the most common financial institution that we know is the bank. They offer a whole lot of option in how to safe keep our hard earned money and they even have products for investment. Though I still believe that banks won’t do any good in terms of growing your money because of the low interest, I am a believer that we all need a bank to house our money. 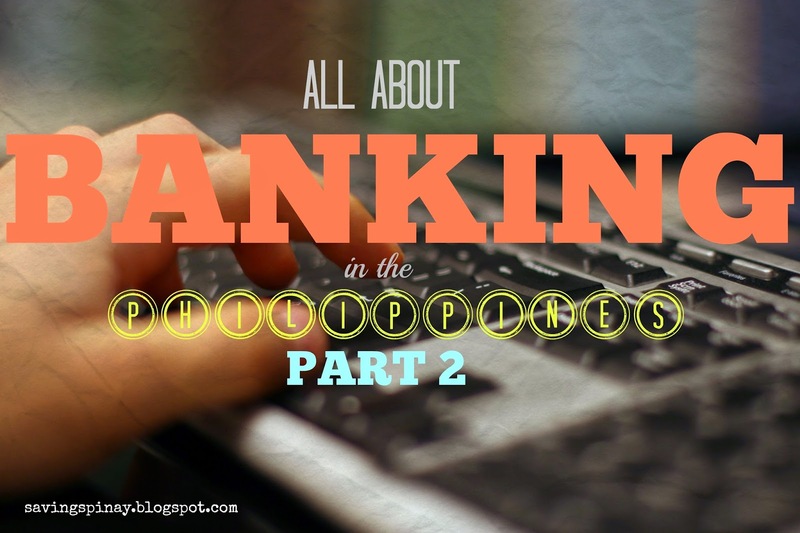 On Part 1 I gave you the different kinds of banks that are present in the country’s banking system. The most common will be universal and commercial banks especially for us na laking Maynila. But not because the bank is sikat will it be enough reason to fully entrust your hard earned money. Banco Filipino was once a trusted bank being founded on 1964 but a tragic news broke on 2011 and it was closed by the Banko Sentral ng Pilipinas because of too much liabilities. My sister-in-law shared how Banco Filipino became her very first bank account as a kid. So if you need a certain criteria when it comes to choosing your bank to park then make sure to follow through the list below. Let me know in the comment section if you have anything to add or if the list did help you decide. Banks that have spent years in the service will as always be a better candidate for your bank. They have the experience, the knowledge and the connection that will make you feel safer.You also want to check whether the bank had been involved in certain controversies such as loss of fund, illegal activities and so on and so forth. The internet supplies all the information for this. You can also go to the website of the bank for further reading. Of course we will have certain people who’ll influence our thoughts and our opinions when it comes to financial decisions. Maybe you have someone close to you that has been loyal to a specific bank and witnessed how great the bank is then you can make the choice. For example. I was influenced to by my Mother to have my bank account in Banco de Oro (BDO). You might also decide depending on how near the bank is to your place. Most of us will surely feel lazy to go to a bank and deposit especially if it’s too far. This happened to me when I opened my Unionbank EON. (Read HERE to know how I opened mine) I already sent my application in the branch in Bicutan but I never had the chance to follow up the forms because I already have my work and going to the said bank will cost me too much time. Also Bank of the Philippines Island was also missing in our vicinity so most people aren’t opening their account there. This is opposite now that I am in Makati where you can find BPI anywhere. Also take note that most people will prefer a bank close to their home or where they spend most of their time. So what’s the nearest bank to you?! Though banks may have the same functionality they offer different added services for their customers. BPI have the Preferred Banking wherein you will have a VIP treatment once you go to the bank. There are also banks that offer higher interest rate for their savings account while other banks promise electronic banking for convenience with great customer service support. Another customary when it comes to banking transactions will be the bank fees. There are banks at no cost as long as the balance in the account is maintained. Others slash small banking fee for every withdrawal or deposit. As part of our hard-earned money it is important to safeguard your money. Banks may offer safety as pat of their service but it is still in your hand to further seal the deal. Make sure that you apply the following steps in protecting your money in the bank. Choose Your Bank Well. Follow the above tips in choosing your bank. Don’t choose an easy to guess PIN for your ATM. Most just do their birthdays or anniversaries but if you can go a little out of the box and select a PIN that is not easily guessed do so. Throw or Shred your bank statement when you withdraw after use. You don’t want anyone be interested with how much money you have. Also they may see your account number and hack your account. Be skeptical in bank calls. Ask intelligent questions to the other line in order to assess whether it is a reliable bank call. Know the owners of your bank — the people behind it and the people who manage it. Find out and ask about your bank’s finances and its strengths and weaknesses. PDIC, BSP, SEC, and your bank’s websites, newspapers, magazines, television and radio will provide most of the information you need. Understand where you place your cash. Don’t confuse investments with regular deposits. Read and understand the fine print and don’t hesitate to clarify with bank personnel terms and conditions that are not clear. Choose the right bank for you by knowing your needs and matching these with your bank’s services. Be aware of bank charges and fees. Secure your passbook, ATM, certificate of time deposit (CTD), checkbook and other bank records at all times. Have your passbook and CTDs updated every time you do a transaction. Inform your bank whenever there are changes in your contact details to avoid bank mails with sensitive information getting into the wrong hands. Do not hesitate to ask personnel to present an ID and always ask for proof of your transaction. PDIC guarantees deposits up to P500,000 per depositor. Investment products, faudulent accounts, laundered money and deposit products from unsafe and unsound banking practices are not covered by insurance. Simply walk away from offers that are too good to be true. Generally, excessively high interest rates carry more risks. Please refer to Bangko Sentral ng Pilipinas Circular 640 for more information.